Women had distinct preferences for how deep mortar holes should be for pounding different types of foods. This pounding rock is ideal for pounding acorns. Shallow mortar holes, like these, were preferred for processing black oak acorns, while deeper holes (6" (15 cm.) or more in depth) were used for manzanita berries. As acorns are pounded into flour, about a gallon of acorns are mounded up over the shallow hole. They are repeatedly pounded with a pestle (weighing from 5-12 pounds (2-5.5 kg. )), which eventually reduces the dried, cleaned, acorn-nut meat into a coarse meal. The meal is sifted with a special basket and only the finest flour is kept aside; the coarser meal is again pounded with more nut-meats, and the process is continued. After pounding, the acorn flour is placed in a sand basin and the bitter tannin compounds are removed by repeated applications of water. 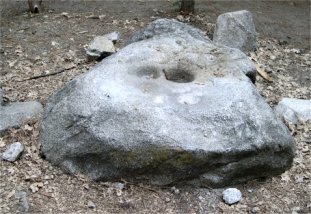 The resultant dough is mixed with water and boiled in watertight baskets by placing and stirring red-hot stones directly in the mush.